Hispanics have somewhat different patterns of information consumption than whites and blacks, according to the Pew Research Center Library Services Survey. For example, Hispanics are more likely to prefer learning in an audio or visual format over text compared with non-Hispanics, and more likely to say that they like hunting for facts and information that are hard to find. The survey also finds that immigrant Hispanics are generally more likely than U.S.-born Hispanics, whites or blacks to predict that they will have trouble finding information and to ask for help in completing some tasks requiring specialized knowledge. The Pew Research Center survey asked respondents about their learning and research habits. For example, it asked whether such statements as “I like to learn new things,” “I like hunting for facts and information that are hard to find,” “I get frustrated when I can’t find information I need right away” and “I prefer audio and video over reading” describe them very well, somewhat, a little or not at all. Patterns of learning and research habits vary some among Hispanics, whites and blacks. For example, Hispanics and blacks are slightly more likely than whites to say that the statement “I like to learn new things” describes them very well—73% and 73% compared with 67%, respectively. When it comes to finding information, 37% of Hispanics say the statement “I like hunting for facts and information that are hard to find” describes them very well. By comparison, somewhat smaller shares of whites (27%) and blacks (30%) express the same view. The survey also reveals that Hispanics are more likely than whites and blacks to say the statement “I prefer getting information in audio and video format than from reading text” describes them very well—27% compared with 18% and 22%, respectively. The survey also finds that Latinos are just as likely as whites or blacks to say they get frustrated when they can’t find information quickly. One-quarter (25%) of Latinos say the statement describes them very well, as do 24% of whites and 21% of blacks. There are significant differences among Hispanic subgroups on some, but not all, of these information consumption statements. For example, the foreign born are more likely than the U.S. born to say that the statement “I like hunting for facts and information that are hard to find” describes them very well—41% vs. 33%. Immigrants are also more likely than the U.S. born to prefer to get information in audio and video format over text (32% vs. 23%).9 On other measures, there are no differences between immigrant Hispanics and U.S.-born Hispanics. For example, U.S.-born and foreign-born Hispanics are about equally likely to strongly agree that they get frustrated when they can’t find information they need right away (24% and 27%, respectively). Other differences among Hispanics are also revealed by the survey. While majorities of Hispanics of all ages say they like to learn new things, younger Hispanics are more likely than older Hispanics to say that the statement describes them very well. About three-quarters of Hispanics ages 16 to 29 (75%) and ages 30 to 49 (78%) say this, compared with only 61% of those ages 50 and older. Yet the youngest Hispanics are also more likely than older Hispanics to say that they get frustrated when they can’t find the information they need right away. Some 29% of those ages 16 to 29 say this statement describes them very well, while 20% of Hispanics ages 50 and older say the same. Hispanics with more education are more likely to say they like to learn new things—83% of those with some college or more education say this, as do 74% of high school graduates, compared with 62% of those with less than a high school education. There were no statistically significant differences between education attainment levels on the other statements. Searching for information on some topics can be easy for some and difficult for others. In the Pew Research survey, respondents were asked about how hard it would be to find information about government benefits and programs; reliable health information; career, job and education opportunities; happenings in the respondent’s community; and politics and current events. When finding information about government benefits and programs, about one-third (35%) of Hispanics say it would be difficult or very difficult to do so. By comparison, 27% of whites and 31% of blacks say the same. And Hispanics are twice as likely to say it would be difficult to find information about career opportunities, job training or educational programs (30%, compared with just 16% of whites and 17% of blacks). The survey also finds that about one-quarter (24%) of Hispanics say it would be difficult to get reliable health information and a similar share (23%) say the same when it comes to finding information about what’s happening in their community. For whites and blacks, smaller shares say the same about finding health information (18% and 17%, respectively) or information about what’s happening in their community (11% and 14%, respectively). Some 18% of Hispanics say it would be difficult or very difficult to find information about politics and current events. By comparison, just 8% of whites say this, as do 12% of blacks. The survey also shows that the ease of finding information varies among Hispanic demographic subgroups. On four out of five items tested, there were large gaps between U.S.-born and foreign-born Hispanics. For example, the widest gap between immigrant Hispanics and U.S.-born Hispanics was on finding information about career, job and education opportunities. Some 42% of immigrant Hispanics say finding information about those topics would be very difficult or difficult to do, compared with half as many (18%) U.S.-born Hispanics—a 23 percentage point gap. The survey also finds that 42% of foreign-born Hispanics say it would be difficult or very difficult to find information about government benefits and programs. By contrast, just 28% of U.S.-born Hispanics say the same—a share that more closely resembles the assessments of whites (27%) and blacks (31%) on this question. 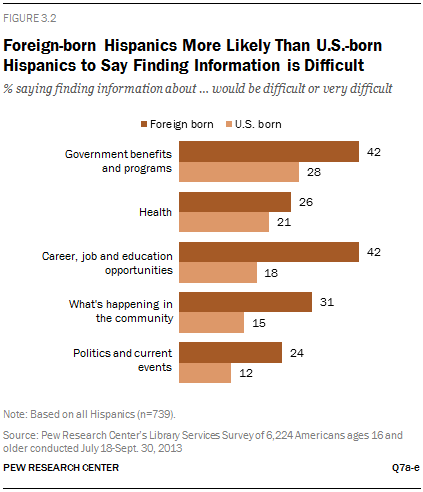 On one issue, health, there was no statistically significant difference between immigrant Hispanics and U.S.-born Hispanics in their assessment of being able to find information about it—26% of the foreign born and 21% of the U.S. born say it would be very difficult or difficult to find information about the topic. The library survey also asked respondents about how comfortable they are with doing certain tasks on their own or if they would be likely to seek help. For the tasks that would require specialized knowledge or education, such as starting a business, filing taxes and applying for government services or benefits, at least half of those in each racial/ethnic group say they would probably ask for help. For example, 76% of Hispanics say they would find help to start a business, 76% would do the same when filing their taxes, and 64% say they would get outside counsel to apply for government services. Whites are slightly less likely than Hispanics to say they would get help starting a business (72%), filing taxes (63%) or applying for government services (53%). Just as with other questions in the library survey, there are many differences among Hispanic subgroups when it comes to asking for help. For example, foreign-born Hispanics are more likely than U.S.-born Hispanics to say they would seek help filing their taxes (84% vs. 69%, respectively) and applying for government benefits (72% vs. 57%, respectively), though at least half of both groups agree with the statements. Both immigrants and non-immigrants are about equally likely to seek help when starting a business (three-quarters of each say they would). Hispanics with less than a high school education are more likely than those with more education to say they would look for help on these tasks. For example, 83% of Hispanics with less than a high school education say they would ask for help with applying for government benefits, compared with 62% of high school graduates and 51% of those with at least some college experience. On technology-based tasks, the divides look different. Hispanics are as likely as whites and blacks to seek help with a new tech device such as a tablet computer or smartphone (49% of Hispanics would get help, compared with 48% of whites and 46% of blacks). And about one-in-four (26%) Hispanics say they would ask for help to use social media like Facebook or Twitter to connect with friends or family—about the same share as among whites (28%) but somewhat less than the share of blacks (34%) who would seek help. Among Latinos, though, the gaps between the foreign born and U.S. born are even wider in these types of tasks than other information seeking tasks. 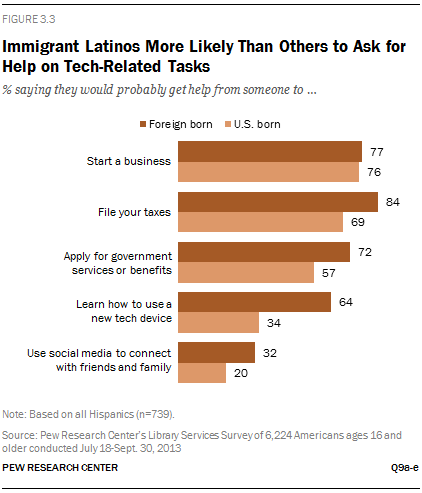 For example, immigrant Latinos are about twice as likely as U.S.-born Latinos to ask for help with new tech devices (64% vs. 34%), and significantly more likely to seek someone to help them use social media (32% vs. 20%). When asked whether they feel overloaded with information these days or if they like having so much information available, more than eight-in-ten (86%) Hispanics and 82% of blacks say they like having so much information at their fingertips. (By comparison, 78% of whites say the same.) This may be due in part to the Hispanic population’s relative youth, as Hispanics ages 16 to 29 were more likely than Latinos ages 50 and older to say they like the high volume of information available today and are less likely to feel overwhelmed. Nonetheless, even when taking age into account, Hispanics are still more likely to feel favorably toward the large amount of information available today. Fully 91% of Hispanics ages 16 to 29 say they like having so much information available, a somewhat higher share than the 85% of whites and 83% of blacks ages 16 to 29 who say the same.